There are compelling reasons to complete your marathon training with a heart monitor. This article will explain the benefits of properly using a heart rate monitor and provide step-by-step instructions on how to correctly incorporate the heart rate monitor into your marathon training. If your goal is to finish or have a faster marathon or half marathon time, the intensity of your workouts is very important. A heart rate monitor can help you determine and maintain the correct intensity for each workout. Essentially, you decide what your heart rate (or zone) for a given workout and then watch your monitor or watch to ensure you reach run within the zone. It’s easy, if you want to get faster, you train at higher target heart rates which help build speed. If you want to go farther, then run with lower heart rates, which can help develop endurance. I completed training for my last 3 marathons with a heart rate monitor using Garmin’s Forerunner 110 watch and their separate heart rate monitor. Although I don’t strictly adhere to training each workout in a certain heart rate zone, I find that using Garmin’s online interface allows me to track my cardiovascular fitness and adjust my training plan if necessary so I can improve my performance in the most effective manner. 3) How tired we feel The problem with each of the above is that they can be affected by numerous outside influences. Specifically, terrain, weather, hydration, nutrition, sleep and even mood can impact all of the above. As a runner who faces much rain and wind in the Pacific Northwest, I know that I can’t skip a workout due to poor weather while I wait for optimal running conditions. Additionally, I can tell that there are some days when my professional life is impacting the quality of my workout. Typically my “Achilles Heal” is lack of quality sleep due extensive business travel. At times, I’m also challenged by inadequate hydration (I’m guilty of drinking more coffee than water). Both of these can negatively impact the quality of my workouts. On the days where weather isn’t an issue, I think I’m well rested and drink sufficient water, it’s still possible to run slower or feel worse than expected. It’s during these workouts that monitoring my heart rate is so beneficial. We now offer a wide selection of name brand GPS watches and heart rate monitors for sale in runner’s store. Occasionally some items are discounted for additional savings. Why I Train for a Marathon using a Heart Rate Monitor: The goal of training with a heart monitor is control. If used properly, a heart rate monitor is like having a coach along for every workout. It helps to ensure that you train at an appropriate intensity, neither too hard nor too easy. Since your heart rate is an indicator of exercise intensity, a heart rate monitor allows you to monitor and precisely control the intensity of your running. Beginning runners often make the mistake of not sufficiently varying the intensity of their running. A heart rate monitor can help you. Ultimately, you want to run longer and faster with a lower heart rate. By uploading daily run activities, you can keep track of your results. Oftentimes, runners just look at the distance and pace they run and may simply note how they felt (that’s if they are tracking their performance at all). This is called perceived exertion. It can be an effective way to train, but with a heart rate monitor, there is actually a couple of ways to see your progress. If you’re improving, you will observe that running the same distances and the same route (terrain) will become easier (you’re rate will be lower). You should be able to run faster for these distances without your heart having to work as hard. This is because your heart is becoming more efficient. Another way to recognize your improvement is to track your resting heart rate (RHR) by recording it every morning before you get out of bed. You should see that as your fitness improves, you will notice a lower resting heart rate. 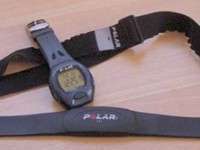 Conversely, where a heart rate monitor can show improvement, it can also help detect signs of over training or fatigue. RHRs may be suddenly higher than normal, even after “easy” days. If you regularly check your resting HR and find that your heart rate is slightly higher than normal, it may be an indication of fatigue caused by a couple of days’ hard training or the start of a cold or illness. Take this as a sign to go easy for a day or two until your normal heart rate returns and you know you are fully recovered. Be aware not to read too much into 1-2 days of higher than expected heart rates. As discussed above, higher heart rates can also be signs of external factors discussed above, like weather, hydration, nutrition, sleep, etc. I recommend looking at patterns over 3-4+ days. If heart rates are trending up, you don’t feel good during workouts and external factors are essentially controlled, then there’s reason to take a step back, rest and reassess your training. Typically, 1-3 days of rest or really light work, coupled with additional sleep each night will allow your body to recover. The key is to observe trends and make adjustments prior to onset of injuries or excessive fatigue. The question many athletes have is how to train with a heart rate monitor and make sense of all the data. To give the numbers meaning, you need a reference point, a heart rate unique to you at a given level of intensity. How To Calculate Your Max Heart Rate: There are various ways to calculate your Maximum Heart Rate (MHR). The easiest way involves subtracting your age from the number 220 for men or from 226 for women. Unfortunately, among experts, this method is not accurate for all runners. It’s considered to be too arbitrary and does not generate appropriate target heart rates for most athletes. In a 2001 Runner’s World article, they discuss two more reliable formulas. Runner’s World staffers concluded that both formulae seem to work almost equally well for runners under 40. However, for runners over 40, formula (B) was more accurate. Accordingly, RW decided that formula (B) would be best for predicting maximum heart rate, and adopted it as their standard. There are two more effective ways to calculate your MHR. 1) You can pay $200-$300 to undergo a lab test. Prior to using this service, however, ensure you are healthy and clear of injury and illness. This will ensure the most accurate results. 2) The least expensive test that’s just as accurate as a lab test is to calculate your own MHR while performing interval training. Use either a slight hill of approximately 200 yards or a 400 meter running track (readily available at most Middle and High Schools). You’ll need a heart rate monitor to measure and record your heart rate while you sprint the distance. Take a short recovery jog of no more than 2 minutes and then repeat the sprint interval up to five times. The average top heart rate you record is very close to your MHR. 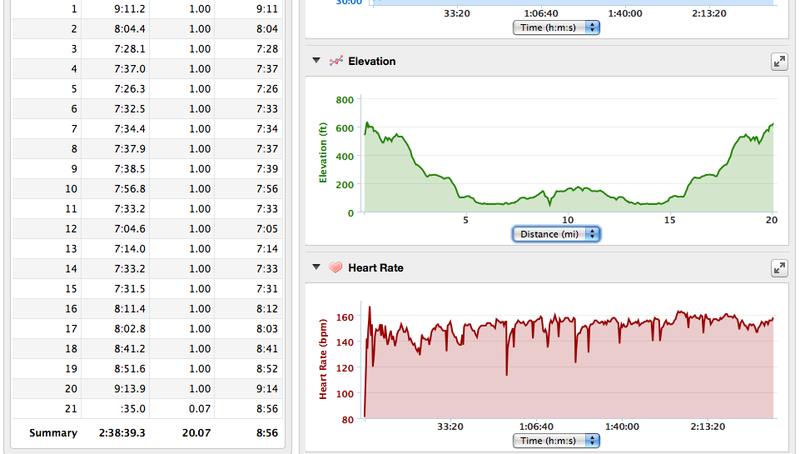 Following image shows my heart rate data from a “hard” interval/track workout. As you can see, disregarding some error at the beginning of the workout (I’m certain my Max HR isn’t in the upper 190s) my top HR tops out around 178. However, analyzing additional data from other similar workouts confirms that my typical MHR will be closer to 177. The best way to train for a marathon with a heart rate monitor: Heart rate-based training involves planning your workouts so you are training at different heart rate zones. One of the most popular zone systems involves training at designated percentages of your max heart rate (MHR) or lactate threshold heart rate that you have previously calculated. Zone 1 is very light running – like a slow recovery jog between high intensity intervals on the track. Use this for warm-up and cool down. Zone 2 is a comfortable pace and used for building aerobic fitness, fat-burning and endurance. Zone 2 paced runs are often referred to as “foundation runs” because they build endurance. Comfortable enough to hold a conversation, this is the most used zone. 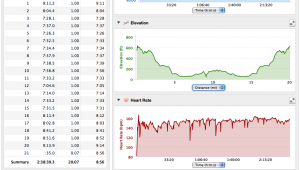 Following is my HR data from a recent 20 mile training run. I could have gone faster, but I wanted to train at Zone 3. Towards the end, my legs felt very tired. Zone 3 is faster than your natural running pace. “Comfortably Hard” or tempo runs. Running in zone 3 is useful for extending the benefits gained in Zone 2. 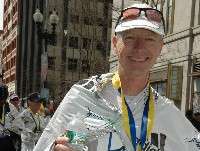 For a marathon runner, Zone 3 training is running at full marathon race pace. My friends and I often use a strategy to finish long runs (last 3-6 miles) at Zone 3 pace. Zone 4 is your lactate threshold intensity. It is a running intensity that requires a conscious effort to go fast. While training in this zone, you should be able to talk in short sentences. It’s not completely comfortable, but you should be able to train at this pace for long distances (such as a 10k). It should be regularly incorporated into your training in moderate amounts to get your body used to that intensity. You can complete Zone 4 workouts in between Zone 2 (warm-up and cool-down) runs. For example: 10 minutes Zone 2 (warm-up), 20 minutes Zone 4, 10 minutes Zone 2 (cool-down). Also, Fartlek runs would be run in Zone 4. Zone 5a is much more stressful than lower zones, so you can’t do a lot of running in this zone. It’s a very powerful fitness booster. To improve your performance, you need some Zone 5a running each week. An example would be high intensity medium (400m+) intervals on the track. Another example, is when you run (6+) x 3 minutes (or 800 meters) @ Zone 5a following each interval with 2 minutes @ Zone 1. When you incorporate Zone 5a training in small amounts it will elevate your running performance significantly. I use Zone 5a training on the track weekly during my 20 week marathon training program. Zone 5b features multiple short segments of fast running separated by active Zone 1 recoveries. Zone 5b is running at the fastest pace you can sustain (a full sprint). It is incorporated into very short intervals and is very stressful. Train at this rate only sparingly. An example would be 200 – 400 meter sprints. Concentrate on form, breathing and stride length when running at this pace. This is a great way to boost speed and running economy. In my opinion, the heart rate monitor is an excellent method of determining how much benefit we are deriving from our training. This is because it’s measurable. However, I caution runners that heart rate training is only one of many ways to train. I think that ultimately, the best indicator of running intensity is actually perceived exertion, or how hard running feels. This is because perceived exertion accounts for heart rate and other physiological and psychological factors that can influence your exercise intensity. Consider that even if your heart rate monitor showed that you were within your target zone, you would likely pay more attention to how you felt and adjust your running based on this perceived exertion, before adjusting because the heart rate monitor indicated you were within or outside of a particular zone. Bottomline, training with a heart rate monitor is very effective. However, don’t let yourself become too attached to the monitor. Consider a mix between using the monitor and perceived exertion.